I had a customer from Texas call the other day and asked for a reclaimed wood conference room table with a nautical theme. I chuckle a bit and ask him, “were you talking with my customer down in Florida?” He replies, “No, should have I?” In nearly 15 years, we’ve never had a call for a nautical themed table, well, except for a customer who called about 6 months earlier. He was looking for something he called a Shipwreck table — something that was rough and craggy — reminiscent of a shipwreck. I thought long and hard about what a might constitute a shipwreck table. 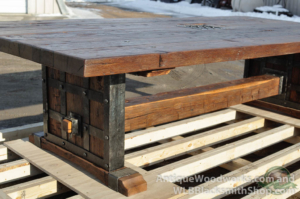 We settled on an idea of a table with ironwork that was reminiscent of pirates treasure chest. My new customer described the mural on his wall of a pirate ship at dock in front of the setting sun. The table couldn’t be a better fit. After a quite a bit of work, I think we nailed it. 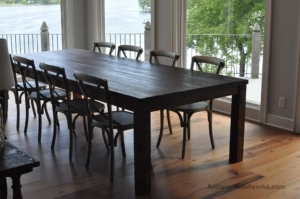 The tabletop is nearly three inches thick and made from old, original hand-hewn barn timbers. They have the rough ax marks from a barn that was built in the 1800s. The wood is white oak and heavy. Yes, heavy. The top alone weighs about 600lbs. When we flipped this periodically to work both sides, we usually had 4 people working the flip. (This is kind of tough for just my wife and me. When we had friends in the shop, they became workers for 5 minutes). The table top has a metal grate seated in place. This functionally allows cords to come up easily through the table top, but it also adds a nice amount of interest on the surface of the table. We debated about trap doors and portholes, but this approach is similar to wood grates on a ship and keeps the top more or less flat. The ironwork was crafted by Wyatt Bienfang at WLB Blacksmith Shop. In a coal-fired, industrial sized forge, he heated up the metal for working. All of the shaping is done on a with real hammer and anvil (no cheating with a trip hammer). The uprights are essentially boxes or cages. All of the rivets are exactly that — real rivets. Imagine that he had to handle this 150 pound, awkward sized box and individually place and hammer sixteen orange-hot rivets at nearly 1800 degrees Fahrenheit. His work really is a piece of artistry. The conference room table is 5ft wide by 10feet long. To complement the table, we also have a matching credenza — complete with an old, handmade, antique lock. The original shipwreck table sports much the same design, except on a smaller scale. It is roughly 41 inches wide x 87 inches long.